Having read the unsettling news in last month’s Newsletter that two of our club’s most revered members had sustained significant injuries as a result of a fall on black ice, I thought this might be a good time to offer some suggestions that might help prevent such unfortunate occurrences while running during these (hopefully now) receding winter months. Unfortunately (for me), much of what I’ve learned about this topic over the years has come less from scholarly information than from personal experience. For some reason – and for the life of me, I can’t understand why – a couple of years ago I began to experience falls while running more times during the past couple of winters than the entire 35 years before that combined. While I have not quite reached this age category, and while the first three of these factors do not apply to me, there is little doubt that the last one undeniably does, despite the fact that I am diligent in performing exercises to maintain optimal strength and balance (see Therapy Corner #95). One can no more maintain the same level of these abilities past a certain age (most experts put that at 45) than we can equal at age 60 the PRs we set at age 25. Whatever loss of strength and balance has occurred has not, fortunately, led to my suffering any “unsubstantiated” falls; that is, I haven’t fallen as a result of a simple misstep or other reason that shouldn’t really happen at this, or any, age. They have all been the result of what I would call “external” causes – like any icy road, or stepping on a tied-too-long shoelace. If that’s the case, then perhaps in addition to maintaining optimal levels of those abilities we should be looking to what else we can do to help prevent falls while running. Besides the obvious measure of tucking long shoelaces someplace safe, there are a few options for improving traction in slippery conditions. For running in snow accumulations of more than 2”, there are several products on the market to help keep your footing. In the interests of avoiding the appearance of promoting a specific product, I won’t name any one device; I will simply say that a Google search of “running shoe snow traction” will yield numerous products that slip over the sole of the shoe. You would do best to talk to friends who have tried one of these to get a review of its effectiveness, durability, ease of use, etc. 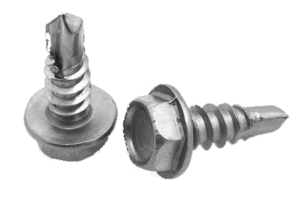 For roads with just a dusting of snow, or those with slush and/or icy surfaces, a simple do-it-yourself option is to place sheet metal screws into the outer soles. Specifically, you want to look for “hex head, self-drilling” 3/8” screws. These can most easily be inserted with a power drill and magnetized socket. (A hardware store rep should be able to get you what you need after you describe what you intend to do.) Place about 6-8 screws around the perimeter of each shoe – at this length they will not go through to your foot, but are long enough stay in securely. At the end of the season, you can take the screws out (just reverse the drill rotation); the little holes in the sole will be of no consequence. Taking these few ounces of prevention are definitely worth the few dollars spent if it helps you avoid what can be serious consequences of falling in slippery winter conditions.